This third major update to No Man’s Sky introduces a 30+ hour central storyline, ancient portals to revisit past planets or random new ones, a new mission system, terrain editing... the list goes on. And on. And on and on and on. There are several items in the patch notes that seem to be trying to balance the game, including revamped freighter prices, improved galactic map controls, and improved object placement. That means no more trees growing on sheer cliffs, but I suppose I’ll make do. The Altas Rises update to No Man’s Sky is available now for both the PlayStation 4 version and that available via Steam. It’s quite a large update and took me 20+ minutes to download on my PS4 despite a great network, so if you plan on playing you may want to start the update now. Then you’ll be set to go after you’re done chilling with us here at DDnet as you do every Monday morning... right? Pigeons and Daddies are a thing of the past: it’s cat-dating time! I am not ashamed to admit that I am the definition of a crazy cat lady. Stray cats literally find me on the streets. There are three in our home, outnumbering humans – I’m quite sure the uprising is inevitable but they are just too cute and affectionate and fuzzy. And three isn’t really enough. I’ve fostered cats, sharing a tiny bathroom with those in need because they needed to be kept separate. So yes, I am easily a crazy cat lady. But dating one? That may be pushing it. Enter Purrfect Date: the cat dating game. There are no words, but there are lots of kitty cats! Purrfect Date promises to be a cross between a dark comedy, visual novel, and dating sim. As a human, you date cats while trying to uncover the mystery of Cat Island. The game features seven chapters, each with a fresh-faced research assistant romancing cats. Cat romance. I guess it’s a thing now. Purrfect Date is developed by development duo Bae Team. It found success on Steam Greenlight, leading to a publishing and co-development deal with Bossa Studios. The game will be released this winter in the North / this summer in the Southern Hemisphere. Expect to see it on iOS, Mac, and PC. Publisher Curve Digital has detailed its plans to bring some of the company’s finest titles to the Nintendo Switch. Having previously found success with these games on other platforms, the publisher hopes to expand their audiences by bringing A Knight’s Quest, Human Fall Flat, and The Flame in The Flood to the portable/home hybrid platform, with the latter two games expected this year. 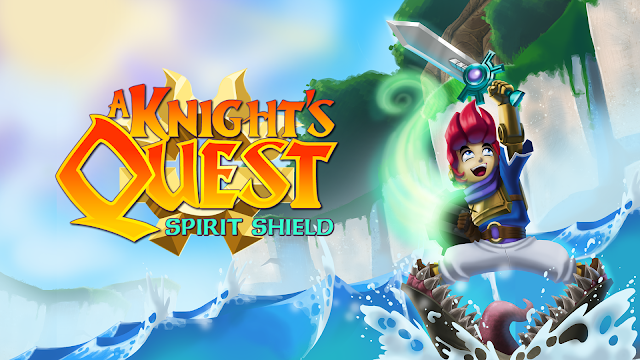 A Knight’s Quest is a new release for Curve, having picked up the title from developer Sky9 Games who had previously tried to find the game through Kickstarter. The game pays homage to 3D adventure games of the past with an enormous game world packed full of hidden secrets and dungeons. Curve Digital will reveal the game with a fresh marketing push; the title has been quite dormant since the crowdfunding campaign. This push starts with presenting the game at Gamescom 2017 and revealing publishing plans for consoles and PC. Both Human Fall Flat and The Flame in the Flood have seen previous releases by the publisher on other consoles. Both games have already been reviewed by our team. Nick reviewed The Flame In The Flood for the PlayStation 4, reviewing the game favourably. I reviewed Human Fall Flat for PC and found the game falls flat. Despite my less-than-favourable review, both titles will be welcomed additions to the Switch library considering each already has a following. The game features a very choose-your-own-adventure feel, with so many options to customize your party and how you choose to play. The need to map your adventure remains critical in Beyond the Myth, with the bottom screen displaying a top-down map that needs to be filled out while dungeon crawling. Turn-based battles means ample time to plot against your enemies. There are four character races and ten classes, with further customisation available through class advancement. Etrian Odyssey V: Beyond the Myth will be released on October 17 in North and South America. A European date hasn’t been announced yet, but I expect it soon enough. The game is exclusive to the 3DS. There is a limited launch edition of the title that includes the game, an art book, a music CD, and a special box to hold all your new goodies.